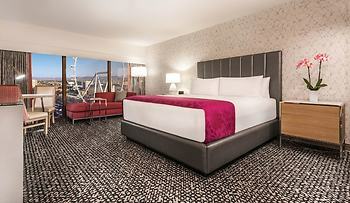 Flamingo Las Vegas - Hotel & Casino, Las Vegas, United States of America - Lowest Rate Guaranteed! We were pleased with the room, which was upgraded and very reasonable. The bartender in the casino was very helpful and enjoyable in helping me play blackjack. Staff at desk told us in advance about the view from the suite, which was fantastic. unfortunately we were unable to stay a second night as we were informed the next morning by a different desk clerk, somewhat rudely, that the hotel was full. The fixtures etc needed updating but could not complain given the beautiful room and the price. The carpet in the halls were ridiculous. it was like walking on lumps. and hand rails were off in the elevator. After getting acquainted with the layout and parking, everything was very nice. Of course, the slots were not very friendly, but we overlooked that. We would return. Thanks for your booking help...it did save us considerable.